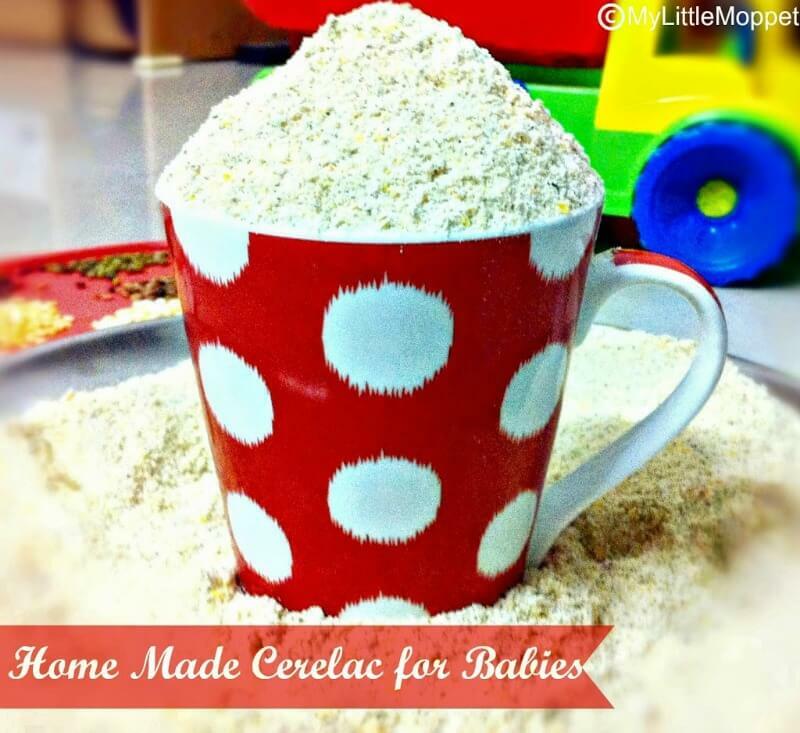 Sathu Maavu powder or home made cerelac is one of the best nutritious Weight Gaining Food that you can offer your baby. 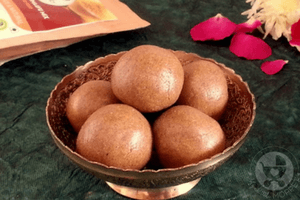 There are many commercial available sathu maavu preparations in the market, they also work out good, but making the health mix at home helps to customize the ingredients according to your baby’s need. I know it is very difficult to prepare such cumbersome powders for moms who are in nuclear families. Believe me !! I completed the whole process from roasting to grinding in 1 hour. Keep all the ingredients ready, Roast all the ingredients in 2 kadai in two burners, please take care they should not be burnt. Remove them to plate immediately after roasting to let it cool, by the time you dry roast the last ingrdient, others will be in room temperature and you can grind them in a jify. If you are grinding it in a power mill, give 1 kg of wheat or rice to grind before grinding this health mix, as the power mill grinds an array of masalas, chillies etc which may contaminate the baby health powder. If you want you can still save the time and effort of buying the ingredients, roasting, grinding, etc. 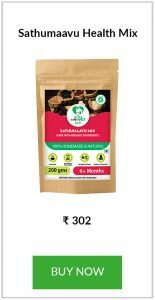 by ordering homemade Sathu Maavu Health Mix Here. 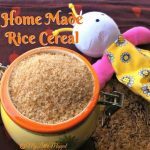 How to make Home made Cerelac or Sathu Maavu or Health Mix for Babies? Start with 2 tablespoons of the Sathu Maavu or health mix porridge the first day and slowly introduce slowly. The ingredients for the sathumaavu can be flexible. I have used a set of ingredients, your health mix can be the same or with options that are listed below. 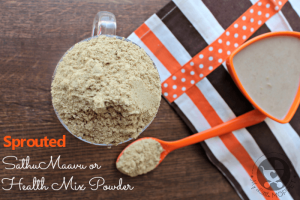 Ragi – I didn’t add ragi because I use sprouted Ragi separately to make Ragi Powder & Ragi porridge. You can also employ the same method for larger quantities. The ingredients can also be sprouted, dried, roasted and powdered. The sprouted version is very healthy and nutritious but is a time-consuming process. You need at least 2 days to complete the process. While making this sathumaavu powder, use clean dry utensils or the powder will get spoiled soon. Soak all the ingredients in water for 10 minutes, rinse and dry them. Roast till they become little like puffed rice. Roast them till they are little dry and crispy. Roast them till dry and crispy. Roast them golden brown or till they crackle. Roast till they leave aroma. 2. Let them cool for few minutes. 3. The roasted ingredients can either be powdered by blender or mixer grinder or in power mill. 4. Sift the ground flour to make it more finer. 5. The sifted flour can be stored in an airtight container for at least 4 to 6 months. Mix 2 tablespoon of sathumaavu powder with water without lumps. Cook the mixture in medium flame for at least 10 minutes. Fruit Purees can be added to the porridge to make it sweet. 1. To a cup of milk add a half cup of water with 2 tablespoons of this sathumaavu powder. Mix without lumps.Cook them in low flame till the mixture is completely cooked. Add sugar and serve hot…. 2. Add 2 tablespoon to a cup of water, mix without lumps. Cook it in medium flame. 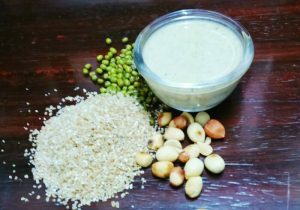 After it is cooked add buttermilk and pinch of salt and serve warm…..
To improve the nutritious value of this sathumaavu powder, Dry Fruits Powder can be added after cooking this porridge for babies. 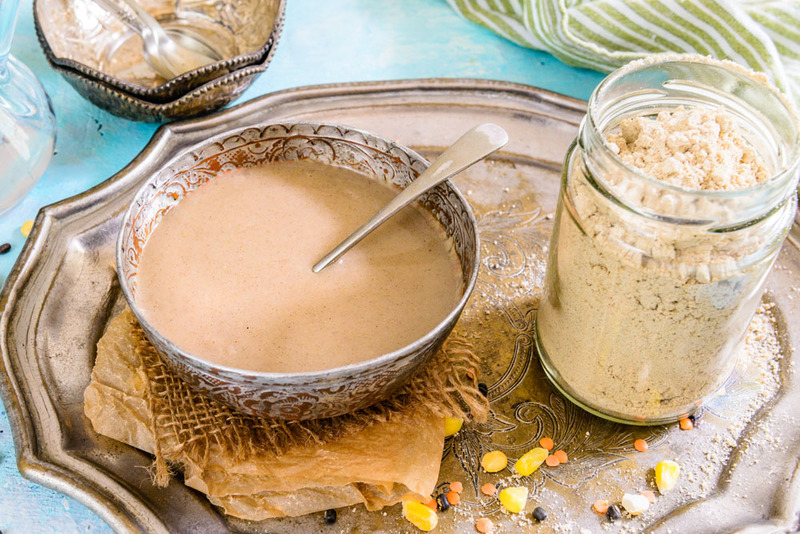 You can also check out these Homemade Instant Porridge Mix recipes which contain Bajra/kambu, Jowar, ragi and more. Just add hot water and the porridge is cooked. It is an Ideal Travel food for babies too. 2. 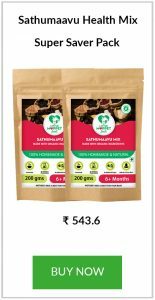 Protein quality of developed home made weaning foods Gupta C1, Sehgal S.
Home made cerelac or Health Mix Powder or Sathu maavu is one of the best weight gaining foods for babies. Roast Rice till they become little like puffed rice. Roast Sago till they are little dry and crispy. Roast Wheat Daliya golden brown. Roast Horse Gram till dry and crispy. Roast roasted bengal gram till crispy. Roast corn golden brown or till they crackle. Roast Almonds and Elachi till they leave aroma. Let them cool for few minutes. The roasted ingredients can either be powdered by blender or mixer grinder or in power mill. Sift the the ground flour to make it more finer. The sifted flour can be stored in an airtight container for atleast 4 to 6 months. Mix 2 tablespoon of sathu maavu powder with water without lumps. Cook the mixture in medium flame for atleast 10 minutes. Fruits can be added to the porridge to make it sweet. Can we add salt in place of jaggery syrup? Thanks a lot for the recipe.. Tried it and my baby loved it…..
We don’t get the black urad dal here can I use the normal one, urad dal w/o skin? Thank you very much for this recipe. I would like to know whether I can give this to my 9 month old son with down’s syndrome as I’m told that he might have digestive issues. I have already started him with rice and moong dal. Hi, my daughter is 7.5 months old. She has eaten only green gram and tuver dal till now. Is it fine if I give all the grams together before trying them individually? I wanted to ask you i am currently in UK ….thus unable to find traditional round dalia that we get in india however i could find the broken wheat version of that. Its basically wheat grain cut into small small peices…..can I use that for this health mix? Looking forward to your reply!! for ur valuable information I am very grateful. thank u for ur patience u answer every doubt. She is not chewing anything as she do not have teeth yet when I feed her any porridge or purees with spoon she is not taking in with her upper lip I had to just pour it in her mouth she is not drinking water with the glass but few days ago she ia drink nicely with the help of glass. I have slowly started giving slowly mango yogurt idli dosa but what ever I feed ahe is keeping it on her tounge and vomiting she is not chewing just swallowing. thank u for such nice recpie (health mix) the thing is my daughter does not eat anything apart from health mix and raagi porridge. Please tell me what else I can give her apart from these two things to gain weight. thank you so much for ur wonderful health mix recepie. My daughter likes it very much she is eating it very well. only thing is since her anna prasanna she ate cerelac that is purchased outside. as I said earlier she vomited everything she ate other than celerac. So apart from cerelac and breastfeeding she dis not eat anything. Since 1 month I am giving her raagi porridge and from past 1 week I am giving health mix. Hema please suggest me what other foods I can start. And how to prepare them. I have mixed d1 spoon of dates syrup in cerelac yesterday she ate it but after 1 hour she vomited. my daughter she is 10 month old going to be 11 months in a week . The thing is she is eating only ragi porridge along with lassi In the morning’s. If I feed anthing besides celerac she is vomiting. can I give her sprouted health mix powder along with dry friuts powder mix. I don’t encourage cerelac ususally, if not all you need to give, do not add juices, you can add fruit or vegetable purees. 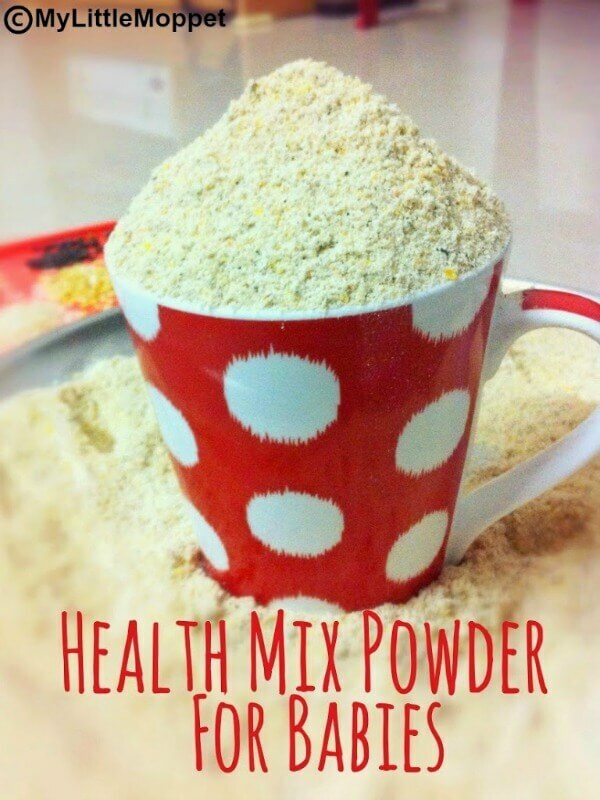 Yes you can give health mix with dry fruits Mix. When you start, feed in the mornings if your baby is tolerating well then you can give in the evenings. Try adding dates syrup in porridges. 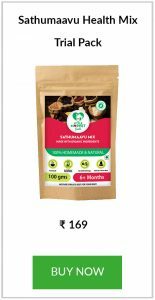 hi hema garu I have started giving health mix powder with dry fruits adding jaggery syrup. She is eating it. Can I also add any fruit juices in the porridge without adding sugar. Do v get sathu maavu powder in stores???? Thank u so my much mam…. Hi.. After preparing this with water or milk..for how long can we use it? If I want to go out for few hours.. Can I prepare this and take it? Will it remain fresh?my son is 15 months old..
my son is 11 months old. i am planning to make the sprouted version. i have emaied you regardng this. can you send me a detailed procedure for the sprouted one? i still have not done the sprouted version since i have a lot of doubts. 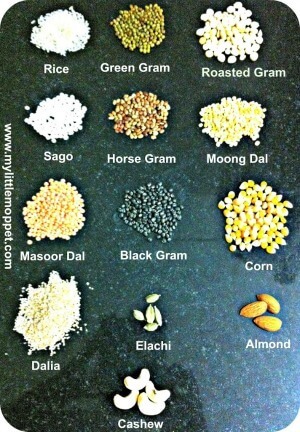 do we sprout the white rice, roasted gram, sago too? if i sprout 2 ingredients at a time, can i dry roast and wait until i sprout everything else…or will they get spoit? while roasting the sprouted ingredients, does it take the same time as non sprouted or can we roast it for shorter time? If possible, it would be very helpful to have a detailed procedure for the sprouted version. As Im planning on grinding this tomorrow. Hi hema i have started this porridge for my 14 month son and he is doing loose motions. What’s the reason? My son is 17months now and I’ve been giving Sathu maavu porridge(using just 1 tbsp powder) along with cooked rice daily (as lunch) since he was 8 months old. I give normal curry with rice for dinner. He really likes the taste of Sathu maavu porridge and eats the lunch quickly. but I am not sure if this food can be given every day for such long time and whether I should continue. Would you pls reply me if its okay to give this as I am giving OR should I limit ? Thanks Doctor for the clarification. I exclude rice when making the porridge. So is it okay to give along with rice as I am not including rice there? Dr. Hemapriya , I am new in your site, and I was searching for a homemade cerelac recipe , and suddenly I found ur site. Thanks for the recipe Dr. Today I had made Sathu Maavu powder and Dry Fruits powder both. Since last day I washed and sundried all the items and today roast and powdered it. I have a quary how many times in a week I can give the Sathu Maavu powder to my 9 monthes girl? And what is the quentity of per servings? Dr. Thanks for this recipe..its mentioned that all ingredients have to be soaked. ..do v hv to soak all 13 ingredients. Is it necessary to wash and soak. Thanks for your quick reply Hema. I have a concern. my baby goes to sleep after lunch at 3pm and wakes up at 5:30pm. Normally I give him about 150ml of milk and some fruits. and at 7:00pm i start giving him dinner. If I give this porridge at 5:30pm, I have to skip his evening milk. My pediatrician advised me to give him 4 times milk of 150ml each which i have cut down to 3 times. now when this porridge takes over, i have to cut down to 2. Can you please help me where i can manage the milk and this porridge.mornings might not be possible coz i give him breakfast like idli or dosa at 8:30am. he sleeps between 9:30 and 10:00am & wakes up for lunch at 12:00pm. a small doubt.The ingredients listed under the Other category, do all of them amount to a cup or individually one cup each coz i believe jowar and bajra are too heavy to digest. also I have a 13month old boy. how much amount of this porridge can i offer him as an evening snack. I washed the rice and dry roasted it but they did not puffed and they have turned golden brown . Can i use the golden roasted rice still in my cerelac or i have to throw it way . Else can i use puffed rice directly after roasting them a little. Please reply soon as i am in thr middle of making it. Hi Mabel, you can use 1 cup of other ingredients except cumin or ajwain. Could you please give the measurement for the “other ingredients “that you have mentioned above. What is the shelf life of this powder? Did you washed allthe ingredients? After washing, do i have to dry them or can roast directly? Hi can i give this mixed with hot water without cooking..? .she is having fevr right now..wat r t foods should I give her nw? will it be ok if i do not soak the ingredients only dry roast and grind. It should not be started as weaning food, it can started after giving rice, dal separately,there wont be any issues with digestion as you are going to use only a spoon of this powder for porridge. Hi piya, this link will help you know about the food varieties to be given to a 6 months baby http://www.mylittlemoppet.com/diet-chart-for-6th-month-babies/, It is better to avoid salt atleast till the first year of the baby. Hey dear.i m really very gratefull to you. My daughter 8 month. And i am very possesive for her health. But i want to know about sprout version. How can i make it with sprout method? The sprout version is same as this, except that you have to sprout all the ingredients separately and then dry it, roast and grind it, do mail me your id at hema@mylittlemoppet.com, will send you the process of making sprouted version. blog from my new iphone 4! Just wanted to say I love reading your blog and look forward to all your posts! Is it necessary to soak n wash all ingredients & can v use salt instead of sugar n stuff? a famous blogger if you are not already. Thanks for reply. one more doubt its safe na to add so many items at a time? have you tried this ?<br />I found this very good still have some doubt so trying to clear it. Yeah it is ok, i gave my son this cerelac from 8 month onwards, so no worries, already you would have started rice and dal for him na, so he will easily adapt to this food…. If I used sprouted things for making cerelac. Then I need to freeze this right?<br />should I use this without freezing which is prepared with sprouting process. Excellent recipe. I really like it. My child is 3.5 month old. Please let me know fromwhat age I can give her the same. Hai Arpita, Thanks for dropping by, You can give this after 6 months and after you have introduced rice and dal for your little one…. Hie<br />Thank you for posting this mixture.<br />Will be making it soon. <br />Had a query though.. Can&#39;t I make this porridge in milk instead of water?